Austrian Hebraist and revolutionist; died at Constantinople March 24, 1877. As a young man he devoted himself to Hebrew studies in Vienna, and catalogued in collaboration with A. Kraft the Hebrew manuscripts in the possession of the Vienna Imperial Library. In 1848 he sided with the revolution, escaping after its collapse to France. In Paris, through the assistance of Mme. Strauss, the friend of Börne, he entered upon a business career, in which he was successful. 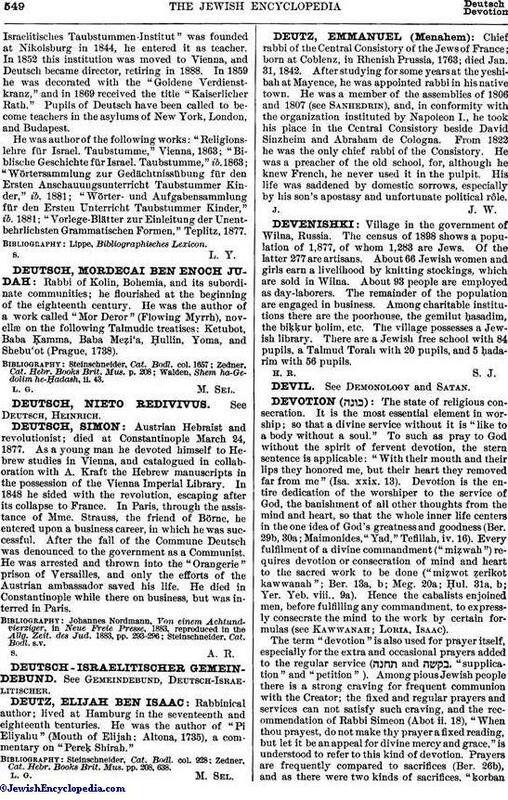 After the fall of the Commune Deutsch was denounced to the government as a Communist. He was arrested and thrown into the "Orangerie" prison of Versailles, and only the efforts of the Austrian ambassador saved his life. He died in Constantinople while there on business, but was interred in Paris.